I think I’ve figured out Bendis’ MacGuffin, and pardon me if I’m slow on the uptake, but All New X-Men is his vehicle for bringing back Jean Grey. 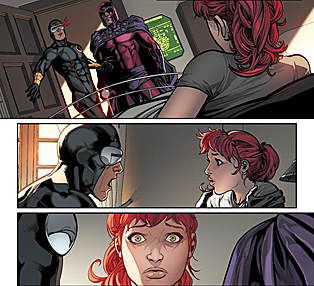 So far, the series has really centered on Jean as she discovers her powers, comes to terms with them, and attempts to make peace with what has become of Scott Summers. With his usual style, Bendis taps into the characters in a way that exposes all their traits, both good and bad. He switches between scenes smoothly, giving the story a nice flow from beginning to end. Each character is given moments that truly express his/her most recognizable traits, and while the idea of having people from the past adjust to the world of the future may get old, it hasn’t yet. Scott’s conversation with a store clerk in particular shows not only how out of place he is, but also how far he’s fallen. My only critique is around the clarity of conversations. Fans of Bendis know he can be dialogue-heavy (and he is in this issue), but his stories are easy to follow. In this issue, particularly with splash pages, the track of the conversation was a bit unclear. These moments don’t detract too much from the overall story, but they’re noticeable hiccups. I didn’t think anyone could improve upon the visuals more than Stuart Immonen, but David Marquez and Marte Gracia keep the same caliber of clarity and beauty in the comic. The smoothness of character designs makes the imagery clean and detailed, and Marquez knows when to shift in for tighter focus or to pull out for greater effect. Sometimes, characters come out of their panels altogether, but this is used appropriately for maximum impact. There’s a softness in Marquez’s design that humanizes the characters, and Marte Gracia’s colors, particularly in close-ups, make the comic a gorgeous read. I don’t know how much longer Bendis can keep this story going because eventually, the X-Men have to return to the past. But the series raises some interesting questions, particularly about how giving people of the past knowledge of the future will impact the time stream. When this occurred in Back to the Future, everything went to hell, and we all know Bendis isn’t afraid to go down that path. I, for one, look forward to seeing this through, especially with such good writing and gorgeous art. The previous issue of Batman was a work of literature. This issue is more of a setup that brings Batman from point A to point B. The Joker turns Arkham into a fun house, yet the villains pose little to no threat to Batman. He suffers a few good lumps, but the story is set up like a videogame where a hero works his way from the bottom floor (and the weakest villain) to the top floor (where his arch nemesis awaits). During his climb, Bruce encounters some of Batman’s greatest nemeses – like Scarecrow, Mr. Freeze and Clayface – yet all are defeated without much effort. What he finds at the top is somewhat disturbing and is more evidence of Joker’s twisted nature, but we’re not given enough time for it to sink in before Snyder moves on to the next phase of Joker’s plan. Furthermore, Alfred was the impetus behind Batman seeking out the Joker, but we don’t hear a thing about him, save for a casual line in Bruce’s thoughts. 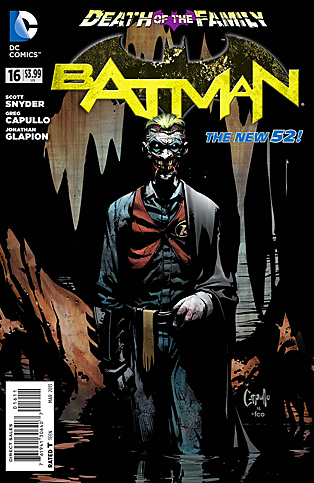 Snyder doesn’t amp up the suspense as he did previously in other issues of “Death of the Family” or even as deftly as he did in the “Court of Owls” storyline. Here, Batman just does his thing, wending his way to the top of a castle. Greg Capullo does what he can with the script, but even his work loses some of its usual flair. The opening pages are spectacular, given the tight, detailed shots Capullo draws, and the shadow-heavy rendering gives the comic an aura of wickedness and evil. Capullo is still masterful at depicting action – particularly when Batman throws down with a myriad of inmates wearing riot gear – but the second half of the book doesn’t have same intensity. This is due to the script halting the action to give the villain the spotlight for a few pages. I also found that the comic ended abruptly with Batman doing a very un-Batman-like thing, and this took away some of the luster. The backup story, written by Snyder and James Tynion, serves as a nice epilogue. I have to wonder why Snyder chose to make it an addendum rather than a true resolution to the issue, because it is a better lead out than what’s given. Even though the arc has only been four issues, it feels long. Snyder’s definitely building to a climactic finale, and I’d be lying if I said I wasn’t engaged by the story (because Snyder’s Joker is one of the best I’ve ever read). But the pacing has slowed too much to give the story urgency, and when Batman faces off against his greatest villain, urgency should be palpably present in every moment. Bannen’s Book of the Week: Choosing the book of the week was really flipping a coin. Scott Snyder’s Batman is a continuously solid title, and Peter Tomasi’s Batman and Robin has been nothing but fun – albeit violent and horrific fun – since its first issue. But what makes Tomasi’s book the better buy this week is its star, Damian Wayne. Due to the “Death of the Family” storyline, Batman has been indisposed the past few weeks, giving all the attention to Damian. And Tomasi definitely knows how to write the character so that he’s the real hero of the series. 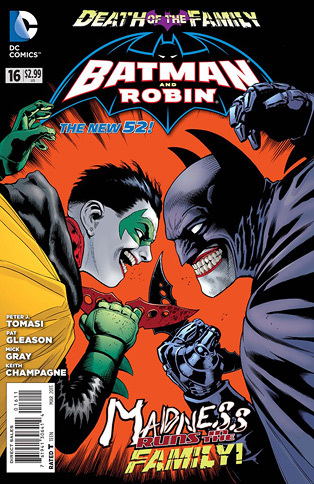 This issue is a mixture of continuous action and maniacal dialogue as the Joker sets a trap for Damian – one that is both physically and emotionally draining. At times, Joker’s rambling can be a bit too theatrical, as if Tomasi needs more evidence of the character’s craziness. And much of Robin’s self-realization occurs through him talking out loud. Whereas Tomasi made Damian into a murderer several issues prior, here he struggles with the decision to end his father’s life or be murdered by him – a conflict that makes for a pretty engaging story in its emotional and psychological weight. Additionally, the amount of action Tomasi plugs into 22 pages is impressive. 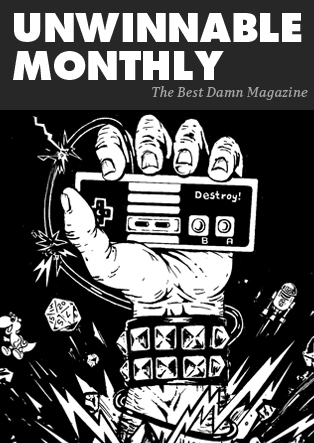 The comic hits the ground running and doesn’t slow down until it reaches its final, cryptic pages. The fight scenes in between show Damian’s resilience as well as his resourcefulness, and Tomasi deftly switches between moments without once losing the rhythm of the story. Of course, Patrick Gleason is the man who brings Tomasi’s insane world to life, and he does so brilliantly. Gleason switches between full-page illustrations and panel-heavy splash pages fluidly, so the comic never loses its clarity. Sometimes, Gleason creates mood-heavy images for effect, and other times he crafts a series of action shots that show the moment-by-moment movements of the characters. Both designs make the story come alive. If Gleason’s good at one thing, it’s drawing a Joker that will make your stomach turn, and he’s not afraid to do this continuously. The book is better because of him. The end of the issue dovetails nicely with Batman #16, and the next issues look like a return to the team-up between father and son. But if Tomasi has proven anything, it’s that Robin doesn’t need Batman to sell books. The character is fully formed, very dangerous, and a ton of fun to read. Damian Wayne is the best Robin, and you don’t need to go any further than Batman and Robin to see that.